Sandra introduces the Discovery Quilt; a group quilt made by members of Acorn Quilters and on display at Discovery Point. 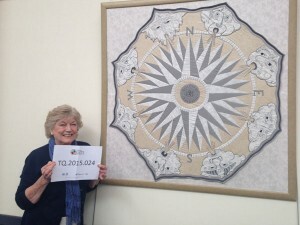 She was inspired by the Mariner’s Compass pattern and sought support from her group to make the quilt. She talks about how the quilt was designed, made and presented to Discovery Point. Later she talks about her own quilting journey including her love of Japanese fabrics and quilts, making baby and Linus quilts and using rubber stamps to make postcard quilts. Jane Rae [JR]: Um, this is Talking Quilts interview 2000… TQ.2015.024. And the interviewer is Jane Rae, and the interviewee is Sandra Smith and we are sitting in Discovery Point in Dundee. It’s half past eleven, and the reason we’re here is the quilt that Sandra has chosen to talk about is on display at Discovery Point. So this is quite a special interview. So thanks, Sandra, for agreeing to be interviewed. Um, I think what we’d all love to know is why you chose the Discovery Quilt; and possibly if you could describe it for people who are listening to the interview, that would be really helpful. 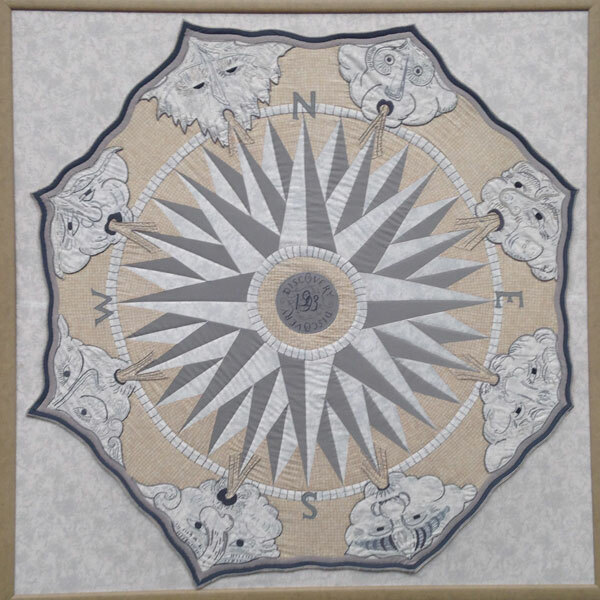 Sandra Smith [SS]: I decided to make the Discovery Quilt after being at a workshop with Judy Mathiesen who is very clever at doing Mariner’s Compass quilts and has written several books on the subject. When I was out in Dundee one day near Discovery Point, I came across the Compass Quilt… The compass as a mosaic on the ground outside Discovery Point. And for some reason, I decided it’d be a good idea to make a wall hanging. And Discovery Point were very helpful to me; I came in and asked if that would be possible, and could I have permission to make the quilt. They gave me plans of the quilt, which I had enlarged. I think it’s roughly about five feet square, the quilt. And I belonged to a group called Acorn Quilters at that time. And some of the group are very good at embroidery. So I let myself do the compass part, and three other remarkable ladies; Norma Scothern, Mary Stocker, and Nora Clark were each plans of the faces around the compass featuring the winds. I think there are eight all together. And they embroidered them, and they are absolutely amazing. JR: Um, can you tell us, Sandra; is Discovery Point… It’s a visitors’ attraction in Dundee. JR: And is that for Scott’s Antarctic exploration? SS: Yes, it is. And it’s just an amazing place to come to; if you’re ever in Dundee, come along and admire the ship. JR: And so when you were… Saw the mosaic, is that lying at the front of the building in the pavement area? SS: It is; and I think most people walk over it and don’t even see it [laughs]. Which… But it is an amazing thing; and it was designed by Maggy Howarth. And at the time when I first saw it, the internet wasn’t around. So I couldn’t find much information about this lady. But nowadays, if you go onto the website, you can read all about her and the amazing mosaics she makes. There’s even one in Rose Street in Edinburgh. It’s quite a small one. SS: Mostly it was because we’d done the Mariner’s Compass with Judy Mathiesen; so it was a link between the compass we’d done with her and then seeing all the faces around; I think it was just an amazing piece of work. JR: And it’s quite an unusual shape; because it’s, um… It’s octagonal, isn’t it? JR: Can you describe the colours of the quilt? SS: Well, it’s quite difficult finding some of the fabrics, but basically there’s only about three colours in it. Various shades of grey, then a terracotta colour and… Some black surrounding to set it off. And… I chose a grey background in the end of Michael Miller crystal fabric; which is a wonderful fabric to work with. And it was very fortunate that my brother-in-law has a picture framing business in Edinburgh. And when we had it made, he took it away, stretched it, and framed it up for us. JR: And so you’ve got the Mariner’s Compass in the centre, and the points of the compass and the winds blowing. So did you… You’ve pieced that, or is there applique and embroidery… What sort of techniques did you use? 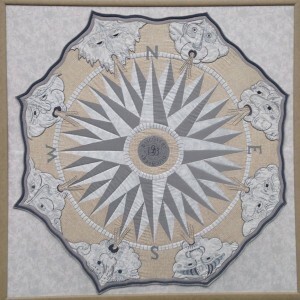 SS: The compass in the centre is pieced… If I remember right, because it’s 22 years ago; I used Freezer paper and the faces the wind… The faces of the wind are appliqued on around the outside. JR: So when you, you saw the design; and you thought, I’d really like to make a quilt. Did you go back to your quilt group and say who would like me help do this? How did you approach that? SS: I knew the ladies in the group who were very good at embroidery. So I just went straight to them [laughs] and, um, sort of said, right, this is what you’re going to do [laughs]. JR: So then… And the ladies that you worked with; um, can you just tell us their names? SS: Yes; er, Norma Scothern, Mary Stocker, and Nora Clark. And, unbelievably, during the making of the quilt, three of us managed to break our arms or wrists. JR: So was it… Is some… Is that just sort of the hard work in stitching? SS: [Laughs] No; just cluelessly tripped over our own feet [laughs]. JR: And you started it in ’97; is that right? SS: Maybe, maybe ’96. It was a couple of years in the making, if I remember right. JR: And did you have to, er, get permission from Discovery Point to use the design? SS: We did indeed. It wasn’t something we’d just sort of go ahead with. And they were very helpful, because they gave me their original plan which I took along and had enlarged. JR: I was going to say the drafting of the design must have been quite complex for you. Did, did you do all of that yourself? SS: It wasn’t really complex; because they gave me Maggy Howarth’s original plan. [JR: Ah, I see] And all I had to do was take it along to a shop in Dundee; and they enlarged it to the size of the final quilt. As now; and that made it all much easier. The drafting would have been a real challenge. JR: Um, you said that there was a lot of embroidery on the quilt. Which parts… Is that in the wind, the faces? SS: The faces of the wind; that, they’re all embroidered. JR: Fascinating; and we’ll get to see some of the detail. Hopefully, when we take closeups. So did the other three ladies with you concentrate on doing the embroidery, or did anyone else share with the piecing of the centre? SS: They did the embroidery and I did the centre piecing and applied it… Everything to the quilt. Appliqued the faces on and then attached it to the background. JR: And did you have to meet regularly as a group to talk about, you know, progress? SS: We did. And people came along to my house; and there’s various photographs taken inside my house. Unfortunately, it was before the days of digital cameras; so there isn’t quite so many photographs as you would have nowadays. JR: I think you’ve done pretty well, though. So what was it like work… Working together as a group? SS: It worked very well. Um… It was a lovely group to belong to, and the ladies involved are just a pleasure to be around. JR: Um, did… So, over how many months and years did it take you to… From start to finish, do you think? SS: It must have been around two years from start to finish. It ended up being shown at the Bonar Hall when we had our quilt exhibition. And when we were at the Bonar Hall along at Dundee University, it was handed over there to Shona Thomson; who at that time was working at Discovery Point. SS: No. It was just fortunate it ended up being made in time for the exhibition we were holding. JR: And so when you started it, did you know where it would end up in its journey? SS: We were hopeful it would [laughs] end up at Discovery Point; but they did accept it, which was very good. JR: So can you tell us… So when you presented it, I mean, that must have been quite, um, quite a milestone, and quite emotional in some ways. JR: Um, so it now hangs permanently at Discovery Point? SS: It does; which amazes me. I think because it’s framed rather than just a soft hanging. I think the fact that it’s framed, maybe, encouraged them to put it up. I wasn’t sure… I thought if it was just a wall hanging, it might get rolled up and bundled into a cupboard; I was worried about that. SS: I think it’s around five by five. JR: So when it’s framed it must be very heavy. Um, it must be quite… Yeah. And is it quilted? Is it three layers, the actual quilt? SS: That’s a good question [laughs]. Um… I don’t think it’s three layers. I think it is simply appliqued onto the grey background. SS: There will be some hand and machine quilting on it; just to make sure it all stays together. Because the… Like we said, it was an octagon, the shape. The background is a five foot square basically piece of fabric and it was stitched onto that to hold it in place. JR: And at that time you would know that it was gonna be hung. JR: And it was gonna be… Er, how it would be displayed. ‘Cause I see you don’t have the heavy weight of the wadding inside it. So I mean, in ’97, where did you buy… Where, how did you get the fabric? Where did you go for the threads and fabrics? Was that in local shops in Dundee? SS: I think we may have gone to Purely Patchwork in Linlithgow; which was a fantastic shop; still is a wonderful shop. But at that time it was run by Pat Archibald; many people will know Pat. And I’m sure we had some of the fabrics from, from there. And Acorn Quilt has very kindly bought the fabrics, and they also paid for the framing. So as a group, we donated it to Discovery. JR: And, um, what was the reaction from the group when you showed them the final quilt? SS: Everybody was very happy with it. I hope they were impressed. JR: Had they seen any of the design as you’d been going along, or did you leave it for a final; a last flourish sort of thing? SS: I think it was left as a last flourish; because it went… It was in bits and pieces for such a long time. JR: So what… Were there any points when you were making the quilt when you thought this isn’t really working; or this is fantastic? What was… You know, did you have any highs or lows that you can share with us? You don’t have to [laughs]. SS: I… No, I think it went pretty smoothly. I remember that the centre of the quilt, which is also embroidered; there’s a piece of embroidery in the centre of the quilt; it has changed because what was on the original plan is not what ended up in the mosaic outside Discovery Point. So Norma was very good at adapting that. JR: So it was interesting that your… That the other three ladies who made it are… Were they more embroiders than quilters? SS: No. They’re just clever ladies. And Mary can… Mary can… Mary and Nora both do lacemaking; which is to me very intricate. Um… No. They, they all make wonderful quilts. JR: So it was perfect really that you had that skill within Acorn Quilters. You could piece it, embroider it; and it’s quite an unusual design; quite different, I would have thought, for quite a lot of people. They wouldn’t have really worked on anything like that before. JR: Um, so when you were at your Mariner’s Comp… Er, the, um, the workshop was that some… Is that a design you’ve always been drawn to? The Mariner’s Compass? SS: No; it’s nothing I ever thought about until Judy Mathiesen came along and we were very lucky to have her. Because for somebody like that to turn up in Dundee [laughs]… It’s quite unusual. But this… She said that what you did as a quilter was find the design and travel the world teaching that skill to other people. JR: And that’s what she was doing? SS: That’s what she was doing. JR: And you said to me, you were able to touch and feel the quilt and examine them up close. SS: I find that amazing; because some people are quite precious about their quilts. And you need the white gloves on and mustn’t touch anything or take photographs. And this quilt was just kicking around the workshop quite casually. JR: So when was that… Was that… So that would be back in the early ’90s. SS: That was 1993; because I bought her book and she signed it for me at the time. And the only reason I know it was 1993 because she put the date on it. JR: Is Judy Mathiesen from the States? SS: She’s from the States. JR: So have you gone on and done more Mariner’s Compass after doing discov… The Discovery Quilt? SS: I did make another quilt with about 12 Mariner’s Compass pieces in it; 12 blocks of Mariner’s Compass. And it’s the usual thing; you start doing something at a workshop and you don’t like the fabrics. You never bring the right fabrics to a workshop. I find, anyway. So I never really was [JR: Drawn to it?] Drawn to it; I didn’t like… Particularly like it. JR: And… So it… Did it get finished? SS: It did get finished; and I passed it on to somebody; as you do with most of your quilts; otherwise you couldn’t move in the house. And I passed it on to somebody who was ill at the time, and just… She cosied underneath it when she was feeling poorly. JR: So all’s well that ends well. JR: So I want… So Judy Mathiesen came to Dundee, and that was when you were with Acorn Quilters. JR: And you mus… So was there a good turnout at her workshop? Was everybody [SS: Oh yes] flock to it? SS: Everybody in the group came along. I… In fact, I think in… At that year, she spoke at one of the area days we had down in Edinburgh. Um, a lovely lady. But most of the American ladies are so helpful. JR: So did she have a suitcase of quilts that she just brought with her? JR: You were allowed to… Play with them for the whole day? SS: Could I tell you the name of the book? Because [inaudible]? SS: I sell you the book [laughs]. JR: So when did you first start quilting, then? What… If we can get… Talk a little bit about that. SS: I can remember exactly when it was; because it was 1986, just shortly before my granddaughter was born. And I went along to an evening class at Grove in Dundee. There was a wonderful shop in Dundee at one point run by Jean Marshall; but I was working at the time and couldn’t go to her day classes at the shop. And then I discovered she was doing evening classes at the Grove and went along there; and I’ve been addicted ever since. SS: Not a single quilt. SS: I think I really just saw them first of all in this lovely shop in Dundee. JR: Because a lot of people said in the seventi… Late ’70s, early ’80s, it was quite hard to find quilting supplies and fabrics in the UK. SS: Very much so; I started off using Laura Ashley fabrics. SS: That was my favourite one; because they coordinated nicely. Er, but no… You… There was very little. I mean, I go back to the days of using templates and scissors. [JR: Yes] Rotary cutters, etc weren’t around at that time. SS: I never did, no. JR: But… But Laura Ashley… I… Did they do sam… Little sample packs of fabric? SS: They did sample packs; they also sometimes did hexagons; readymade cut out hexagons. But the fabric was a little bit heavier than American fabrics we’re used to [JR: Yes] working with. And she doesn’t do that type of fabric any more. SS: It’s mainly upholstery and curtaining fabrics and in [inaudible] are much heavier fabrics. JR: So did you make a hexagon quilt? JR: What was your first quilt? SS: It was actually Diane Leone and it was a sampler quilt book. [JR: Mmm] And [laughs] it’s very fetching; I used Laura Ashley. It was navy and maroon and beige [laughs]. And I think… Oh… And I finished the quilt, but it has no wadding and it has no quilting [laughs]. JR: So did you just put a backing on it? JR: But it… Well, we’ve all had a starting quilt. And do you use that, still? SS: Yes; it’s still in the house. But mostly I’ve made Linus quilts and baby quilts. [JR: Ahh] That’s my favourite thing to… One of my favourites. In my little cul-de-sac alone, between two houses own… Three houses; I’ve given away over 20 quilts to babies, grandchildren. JR: Oh, lovely. So do they all come to you when there’s a new baby on the block? SS: Fairly simple. I’ve sometimes done very complicated ones, but I do find mostly the people I’m giving them to don’t realise [JR: Yes] the work in the more complicated designs. What attracts them mostly is the fabric. JR: And the… Do you choose the fabrics, then, to suit the little person you’re making it for? SS: I let them choose. [JR: Aha] And what I find is they always go for the newest fabric in my stash. SS: If you try to get rid of some of your older fabrics, they are bypassed; and the very latest fabrics are what people seem to enjoy. JR: So do you put a wadding in; and a… Do you put fleece or anything on the back, or… What do you…? SS: I prefer using wadding and a nice backing. But I know most children love the fleece on the back. But I just hate how it looks. JR: Yes. Well, you don’t get the same, um… Is it the word loft? The sort of… The quilt doesn’t lie very well, does it, if it’s got that fleeciness. SS: It doesn’t lie very well; but the children love the cosiness of it. JR: Yeah; and so how nice… That… When you… Do you quilt them quite heavily or do you just keep it quite simple? SS: I’m guilty of just quilting in the ditch when it’s a baby quilt; keeping it very simple. JR: Yes. So are you working on any baby quilts at the moment? SS: No babies have appeared at the minute; so the… No babies to make anything for. But I do have a little great grandson, and he ends up with quite a few quilts. JR: Lovely. And a Linus… Do you… You… Are you part of a local group then, Sandra? SS: Part of a local group; and we make lots of Linus quilt… We have Linus days where we just bring our sewing machines along and usually the Linus rep comes along and we can present her with some quilts at the end of the day. JR: And you mentioned your stash; which is always an interesting thing to ask somebody. Can you describe it for me? Tell me what fabrics are in there? SS: It’s embarrassing to describe a stash; because there is so much and I’ll never live long enough to use up all the stash. I keep telling people when I pop my clogs, they’re going to have a wonderful time [laughs]. Because I’ve been collecting for 30… There’s nearly 30 years. And anywhere I go in the world, I always manage to pick up fabrics. The best ones were in Dubai; where I was able to get very new American fabrics for a pound a metre. JR: Gosh; did you have a… You would fill your… Were you living in Dubai, Sandra? JR: So did you go down to the mark… Was it the Souk that you went down to? SS: I did, indeed. Before I left, I contacted somebody out in Dubai. That was the early days of the internet when I first went. And there was a lovely lady, Alison, out in Dubai. And I met up with her when I was there. And she took me along to the Souk. JR: And did you fill your suitcase with fabric? JR: What sort of fabric were you buying? SS: Well, that was the surprising thing; although it was only £1 a metre it was some of the latest American fabrics which were selling over here at that time for probably £7 or £8 a metre, I think it would have been. And he just measured it out roughly and tore it off; and that was more fabric for the stash. SS: I knew most of the fabrics; they were in my mind already from having seen them on the internet or in shops over here. And I knew I would use them; because I do tend to make a lot of Linus quilts and baby quilts. JR: Yeah; and… So what fabrics do you like to buy just to have in your… Have you got ones you just like to look at in your stash? SS: Well, there was a wonderful… Um, internet thing years ago called Q Toons. And she used to do these quirky applique cartoons of ladies who quilted. And one of them was Confessions of a Fabric Fondler [laughs]. And you know how we all like to touch fabrics and you can just go into your stash and say oh; oh, I can’t cut into that; I’ll just handle it and have… Feel it, and… No, my favourite fabrics are probably Japanese fabrics. JR: You mentioned that in your questionnaire that you filled in; I thought that sounded fascinating. So what… What sort of… Can you describe a bit more about that? SS: Some people out there might know about Euro-Japan Links. And they bring in, import fabrics from Japan. And I find them amazing to work with, and very different. In fact, they’ve set a few people off on making quilts and putting sashiko stitching onto them. They came in symbols from Japan are quite popular for people to start off with. SS: It’s not linens, but it’s a slightly heavier cotton. SS: Mostly; mostly it is darker colours. Quite heavily patterned. JR: Is that to show the contrasting sashiko stitching? SS: No; if you’re doing the sashiko stitching you would be tending to use just a plain fabric. But they have some wonderful prints [INTERRUPTION] with dragonflies and flowers; chrysanthemums, all sorts of beautiful… Again, just something to ad… To admire and touch. JR: And have you… Did you do any classes in sashiko? And maybe you can tell us what sashiko is for the interview. SS: Sashiko is Japanese hand-stitching. And you use a larger stitch than you would use for traditional hand-quilting on our quilts. Using sashiko threads, which come in amazing colours. Susan Briscoe is just the queen of sashiko. Normally, sashiko would be used using a double thread. But I have always used a single thread; so I’m not a total traditionalist with that. I find it easier to work with. JR: And do you need a special needle for sashiko stitching? SS: You probably need a slightly larger-eyed needle; because the thread is thicker. JR: Um, what about the designs? Are they very traditional Japanese stitch designs? SS: Most of them are… Kamon crests; and they are very traditional. I’ve used them for quite a few quilts. And I did Pat Archibald’s Creative Journey class and made a Japanese-style quilt for that to re-create a journey I’d made with my daughter to Japan. She was with British Airways and I went on a day trip to Japan. SS: From Heathrow to Japan for the day. JR: What a fantastic experience! SS: Well, it was pretty unusual; because when I travelled with my daughter who was cabin crew, I never knew if I was going to get onto the flight. So it was a last-minute dash for the plane. SS: Very little luggage; and just take off down to the stands and hope we got on board at the last minute. And there was no seats for me to sit on when I did get onto the flight. So I sat on the jump seat; crew for take-off, crew for landing from Heathrow to Japan. And, to be honest, I’d have stood to get there [laughs]. JR: So how long was that journey, then? SS: We went into Narita where the planes land at Narita airport. And we went into Narita that evening; and I just stood and looked at the ground, and couldn’t believe I was actually in Japan. It was amazing. JR: So you were… Obviously felt this really… This is… You felt a connection; some, something when you got there. SS: Yes; I had… I had lived in Hong Kong and I’ve got a real feeling for the Far East. SS: I did know about Japanese quilting at the time. JR: And did you find any shops [laughs]? SS: Would you be surprised to hear I found shops [laughs]? Yes. Um, in fact, I’m using some of the fabric at the minute to make a quilt for our exhibition next year. [JR: Oh, so it was…] Er, I bought it when I was in one of the shops in Narita. We didn’t tackle Tokyo; we stayed with Narita. JR: Right. So you came away from that thinking I want to make some… Do some Japanese stitching and make… So was that you hooked? SS: That was me hooked on Japanese quilting. That’s… That is one of my favourites. JR: And… So do you find there’s quite good places for you to buy what you need? SS: I simply need to phone Mary at Euro Japan Links and she’ll send me up samples; she’s very good, very helpful. And Susan Briscoe, unbelievably, now lives in Scotland. JR: So you’re in heaven. SS: So we’ve… We’ve cracked it; we’ve got it [laughs]. JR: So you mentioned you’re making a quilt for your exhibition. JR: Can you… So what sort of, um, design is that? SS: Well, what they decided to do this year was try to make some strippy quilts but with a modern twist. So I’m using the Japanese fabrics; I’m not quite sure if that’s modern or not. SS: Yes; but I… These fabrics have been sitting in the cupboard since… Oh, about ten years now. So this just seemed a proper occasion to use them. JR: And how big will the quilt be? SS: I believe it’s about five feet by six feet. JR: Do you use your quilts for bed quilt or do you hang them on the wall, or… Do you have any preference? SS: I quite often end up giving them away. JR: You do; is that mean… Does that mean that you can then start on another one…? SS: Start on another one. SS: Not feel overburdened by quilts. But there are one or two that I simply won’t part with. And, um, I’ve made, I’ve made hun… I must have made hundreds. SS: You’re right. That is one of the nicest things about it. I… I wish I could show you all the photographs of all the quilts I’ve given away; because there’s hundreds of baby quilts. Some of the babies who were given quilts of course are now at university rather than… All grown up. And one of them still keeps part of the little quilt I gave her. It’s her comfort blanket still. JR: Did you take pictures of all the quilts, then, before they’ve gone away? JR: We’ve got… Under your own gallery? JR: How lovely. And some of the people you’ll have known quite well; other, for Linus, the quilts will go and you won’t know who they’re going to? SS: You don’t know who they go to with Linus; in the early days, I had made the mistake — and you’re not meant to do it — of putting my name and address on the quilt. And in that instance, I actually got a thank you letter back with the baby’s footprint on the card. So what did I do, I burst into tears [laughs]. SS: Er, but it would be lovely; but I think there are reasons that you can’t put your name onto the quilt you give. But it was just so lovely to get this thank you with the baby’s footprint. JR: And so that’s obviously a big thing for you, to give them away as gifts. But I, I know when you were doing the questionnaire, you said you also like the social side of quilting. So has that always been a big part of it for you? SS: That’s a huge part of it. The people you meet because of quilting is… It’s just amazing the people you meet up with. And when you’re going overseas on holiday, quite often you can… Can contact a quilt group and meet up with other like-minded people in all parts of the world. One lady I met in Florida; it turned out that her son-in-law was coming to Dundee to start up a business. I kept in touch with her until she died in her nineties; and I made quilts for all seven of her great grandchildren. SS: And I have the photographs of the children with their quilts. JR: You must find the internet a real… A really good thing if you’re travelling; to find groups and information. ‘Cause it sounds like you love the whole international element of quilting. SS: Well, I’ve been lucky enough to travel overseas on holiday everywhere from, you know, Singapore, Dubai, just lots of places that are really interesting. And you find fabric shops, unbelievably. And there’s such a contact. You know, you just mention to somebody you’re going somewhere; and they will give you the name of a fabric shop. SS: Well, usually, it’s simply going on holiday with my husband. And when we went to Florida, we went to Rainbow’s End in Dunedin. And he just sat outside with his crossword and waited for me to eventually come out of the shop with lots of bags of fabric. JR: What fun. And so you mentioned you lived in Hong Kong. Did you quilt when you were living there, at all? SS: Strangely enough, no; I never… I had no contact with Patchwork at all at that time. JR: No; was that pre-eight… Was that pre-’80s? SS: That was early ’70s. JR: So you really started quilting when you were back in Scotland. SS: Back in Scotland. Not until eighty… Must have been ’86. JR: And I know you’re a member of The Quilters’ Guild. SS: Oh, again, it must be over 20 years. SS: Again it’s contacts you make, um, going to AGM and again going to the regional days, area days that we have in this part of the country. And going to the Festival of Quilts as well. JR: Do you go down an, annually for that? SS: Go down annually; I think this is going to be my sixth visit this year. JR: And that’s coming up quite soon, isn’t it? JR: So I presume you will get a good… Great selection of Japanese fabrics or baby Linus… There’ll be loads of beautiful fabrics. SS: Lots of beautiful fabrics; Euro Japan will be there. So there… And I always say, like, everybody else who quilts; I’m not going to buy any more fabric. Or I’m not going to buy any more fat quarters. But we all know we’re really lying to ourselves. [LAUGHS] Because it’s not… Not going to happen. JR: Do you, um, look at the quilts that are entered for competition? Do you go and see the quilts on display as well? JR: Which ones do you like to go and see? SS: I think every single one I enjoy looking at, hoping to get ideas from that. And being in awe of some of the pieces people can produce; because I think people who aren’t involved in quilting just have no idea what people can achieve with fabric. JR: Are there any that jump out that you can remember, Sandra? Um, from recent years. Anything in particular or any styles that have stayed with you? SS: There was one a year or two ago which was of a fire in California; and it was all done in reds and blacks and the charred trees in the background. And, strangely enough, I ended up sitting on the bus trip to one of the evening events by the… Sitting beside the lady who had made the quilt. JR: It’s quite… Sounds quite… Quite a dramatic… Project. SS: It was very dramatic quilt. I think it’s actually maybe on the front cover of the Festival of Quilts leaflets this year. I think I saw it somewhere on that. JR: I’ll have to go after this and have a look for that. So are you a member of any groups in Dundee locally again? SS: I belong to a group now called Coastline Quilters; it’s more a group of friends who meet regularly to quilt. And there’s also some knitting and eating lots of home baking. JR: Yes; I noticed the home baking reference in the questionnaire. So it’s really just a group of people who like to make and socialise together, and share. JR: Do you take, er, sashiko with you? SS: We take sashiko with us. Um, I’ve set one or two people on that road. I’d made a quilt a few years ago, which had sashiko quilting on it, and the Kamon symbols. And I used blocks from a book called East Quilts West Kumiko Sudo. SS: And I adapted some of the blocks; and some of the ladies in the group liked it, and they went on to make quilts based on my quilt; which I was quite flattered about. SS: Acorn Quilters still exist; they meet up in the evening. And I quite like the during the day meeting. And we meet every single week. Acorn just meet up once a month. SS: The Linus days, and some days we just have a day where… I think in July we’re having a day where we’re going to make fabric postcards. That’s another thing I love making. JR: Can you tell us a bit more about that? SS: Fabric postcards… Well, I’ve also got a collection of rubber stamps. SS: It’s embarrassing. Because [laughs] I had to buy some drawers from Tesco to house all these rubber stamps. Er, fabric postcards are basically made up from element vinyl. Then a piece of calico Bondawebbed to the back. And the fabric, you can stamp on it or… I sometimes even do sashiko on that, using Japanese fabrics to make up a pretty postcard. And we sell them on the sales table. SS: To raise money. We raised about… Last year, or last time we had an exhibition, we raised about £1700. SS: And we have it, an amazing place; we have it in the little Episcopal Church in Monifieth; which is a lovely venue. And then we have to very quickly clear everything away on Saturday; vacuum round all the threads and put the chairs back for the church service the next day. SS: Just carry on from there. It’s… The rubber stamps; quite often I use Dina Wakley who has quite quirky stamps. SS: Ink pads. [JR: Ink pads?] Ink pads quite often. SS: Sorry. Laughing too much. [JR: So…] No, the rubber stamps… There’s lots of wonderful coloured ink pads and rubber stamps… I never knew about rubber stamps before one of our group, called Heather Chortley, and some people listening to this will know Heather. And once you’ve met Heather, you will never forget her; she is such fun. And she introduced me to lots more ways to spend money. JR: Do you only use them for fabric postcards? Or do you use them for paper as well? SS: You can use them for paper and sometimes doing journal quilts. JR: Oh; do you do journal quilts, Sandra? JR: When is… When’s the exhibition? JR: So you have a little bit of time to catch up. SS: Well, it seems like a lot of time; and then it suddenly is upon you. Because last year when we were getting ready for it, one of… The local bishop said to his wife, I think you belong to a middle class sweatshop [laughs]. We were working so hard to get everything finished. JR: So you’ve got your Japanese quilt for that, and your journal quilts. SS: Journal quilts; I think we’re doing cushions. SS: And fabric postcards. I mean, make up ordinary cards which are quite good; because you can sell them quite cheaply. So people don’t feel awkward about having to buy something larger from the sales table. A pound or two for a card, and they feel they’ve done their bit. JR: So have you ever posted a fabric postcard to anybody? SS: All over the world. JR: [Gasps] And do you swap them with people? SS: Swap them with people. SS: And you get some wonderful ones back again. JR: And how many do you think you’ve made? Do you know how many you’ve made? SS: Probably over a hundred, I would think. JR: So are they the standard size of a postcard? SS: This is standard size; approximately 4×6. JR: So that sounds quite contemporary. ‘Cause you’re using different techniques. JR: Do you colour the, the calico? SS: It’s nudged me into the modern age of it; into mixed media. Hmm… Scary thought. JR: Lots of things to be bought in that department. SS: We can always find ways to spend money. SS: Well, one of my favourite places to visit is Barbados. So the one I’m making at the minute has some of the little chattel houses at the top. And then I’ve… With fabric, I’ve made the sea in different shades of blue. And I’m going to machine quilt that. I’m not good at free motion quilting; I’ve never mastered that. But straight-line quilting, to just give a bit of depth and texture to the piece; I can manage that. JR: And can you just tell us under a journal quilt; just for the interview; um, what that actually means? SS: A journey quilt is approximately A4 size piece of work. And it has the fabric top and then a bit of wadding and a backing. And we’re given different themes to make up the journal quilts. JR: And quite good fun for the group to do. SS: And they all turn out so differently. We don’t have a set… You know if somebody says the beach; well, every beach is going to be totally different; because some will be overseas like mine; some will be Scottish beaches. So it’s not a theme that we stick to very exactly. It’s not carbon copy [JR: No] of anything. You all just take our own ideas into it and interpret it. JR: So the exhibition sounds like that’s gonna be, um, quite a lot of work for the next 12 months. SS: For the next 12 months, it’ll be heads down, working hard. SS: No trips abroad planned at the minute; but the next trip I plan to make is down to York before the museum closes. JR: Oh how… And there’s obviously… Do you know when you’re going for that? SS: I’m hoping to go in a few weeks’ time. JR: To see the Kaffe Fassett exhibition? SS: To see the Kaffe Fassett. Yes. JR: Fantastic. Er, well, I can… I do know that there’s an awful lot of lovely things to see and to buy associated with the exhibition [laughs]. SS: Well; I have to admit; my life is on my credit card. JR: Do you like… You obviously like Kaffe Fassett fabrics and designs. SS: Go through, just to look at; just the pleasure of looking at all the photographs. SS: It’s a huge part of my life. It’s helped me through quite a difficult time these past few years. And, er, without it, I’d be… I’d be lost. JR: So it’s… And is it the r… Relaxing, challenging… Are there… Is it a whole lot of different things for you? SS: Norma Scothern. [JR: Go on, yes] Norma is… Well, she wouldn’t mind me saying, I hope… She will soon be 80. Next year, before she turns 80, she is going to go on a trip which takes in, er, Tristan da Cunha, I believe, and Antarctica. SS: Which I just think is a… Absolutely amazing. JR: Are you not tempted to go as well? JR: Is Norma still quilting? JR: And what about the other ladies in the group? Are they still stitching? SS: Nora is still stitching; Nora is now almost eight… No, she’s heading for 90 now. That’s frightening how the years fly past. She is still stitching; she made a lovely Linus quilt a few weeks ago. Um, Mary not doing so much because she is in hospital at the minute. But we all find it just such a joy; because we support one another. If anybody’s having a bad time, [JR: Yes] we’re there for them. SS: No, it’s not at all. SS: Well, I never enjoyed dressmaking as such. I was never going to be a dressmaker, a seamstress. When I lived overseas you could make up a little A-line dress in next to no time; a few seams and you had a dress made. But that never appealed to me to make proper clothing back here. And falling into patchwork has just been… Brought so much pleasure to my life. SS: Only… Only in sewing; because in my days, going to school you were taught sewing from primary school upwards. You had all your sample books, your embroidery; which I don’t think many people do nowadays. JR: No; I don’t know if it’s on the curriculum; um… But it… I suppose that people rely on grandparents or aunts or… To pass it on. Do any… Or does anyone else in your family quilt? SS: I’m embarrassed to say nobody else [laughs]. I only have… I only have one granddaughter; and she has been slightly into quilting at times; but she hasn’t really got hooked. So… I’ll keep encouraging her, just in case. JR: Well, it’s been really fascinating talking to you today, Sandra. And, um, I think, er, I hope that everyone can come and see the Discovery Quilt on display. Because it’s going to be here for many more years to come. JR: And, um, just lovely to see the quilt. It’s really a piece of art, isn’t it? SS: Thank you. 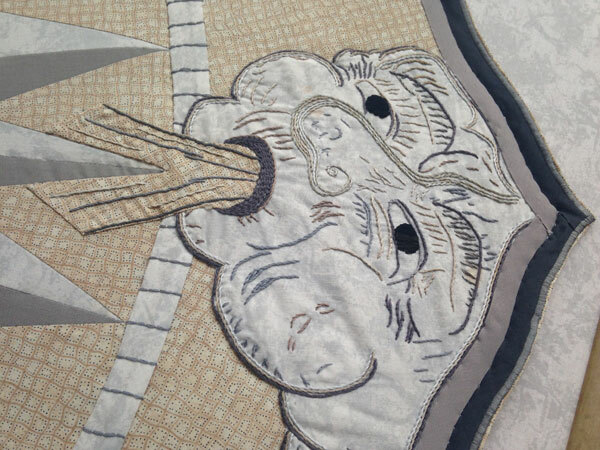 But mainly due to those embroiderers who were just able to do those faces. JR: And, and lovely to talk to someone about a group project for Talking Quilts. So, um, I think that’s the end of the interview for today; so thank you so much. SS: Thank you for interviewing me; thank you for letting me be part of it.